Rancho Bernardo Dentist | How Do Dental Implants Work? Classic Dental Smiles > Classic Dental Smiles Blog > Dental Implants > Rancho Bernardo Dentist | HOW DO DENTAL IMPLANTS WORK? Missing teeth can be detrimental to not only your dental health, but also your self-esteem. While there are many procedures that will replace missing teeth, one of the best treatments are dental implants. Implants work by replacing both the root and crown of your missing tooth to give you your oral health and beautiful smile back. At Classic Dental Smiles, we offer the best implant dentistry services in the Rancho Bernardo, CA area. Dental implants use a titanium rod, which is placed directly into the jawbone. This will supply the crown with the stability needed for years of use without the need to harm or damage surrounding teeth. As the implant heals, it will fuse with the jawbone to create a strong and stable base for the crown. 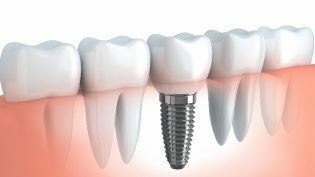 Once the implant is fully healed, a crown will be placed on top of the implant to replace the rest of your tooth. The crown is customized to fit your mouth comfortably and to match the shape and color of your natural teeth so it blends in seamlessly with the rest of your smile. One of the main benefits of dental implants (as opposed to other tooth replacement procedures) is that they keep the jawbone healthy. When a tooth is lost, the body will start to redirect the calcium that was being used to hold in the tooth in the bone, to other areas of the body. Over time the bone will start to disappear, which can completely change the shape and feel of your mouth. The implant helps the body into thinking there is still a tooth there so it will keep the bone in that area. Unlink a dental bridge, dental implants do not require working on other teeth. Only the area missing the tooth is addressed. Adjacent teeth do not need to be filed down or touched. This not only helps to keep costs down but in the even that an issue comes up in the future, only the implant needs to be addressed instead of multiple teeth. Research shows the success rate of implants are well above 95%, much higher than any other tooth-replacement procedure. If you live in the Rancho Bernardo, CA area, have one or more missing teeth and have been considering seeing a dentist about getting it replaced, please contact Dr. Brian H. Chan and his team at Classic Dental Smiles for more information or to schedule your dental implant consultation.